2.5 billion naira is hanging in the balance, and wife of the president, Aisha Buhari wants to see the end of the matter. There were reports that her Aide De Camp (ADC), CSP Sani Baban-Inna, has been released by the Department of State Service (DSS), but Buhari has denied the story. 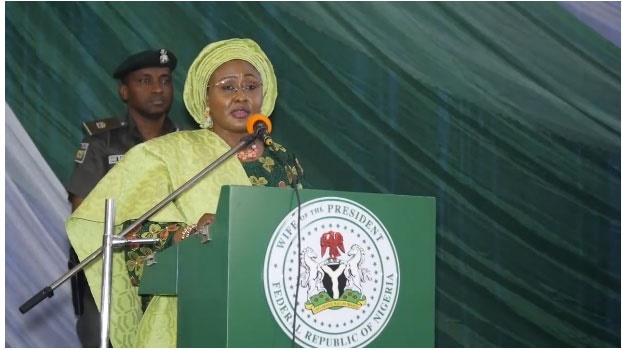 “The officer (Baban-Inna) is being investigated on allegation of corrupt practices, which is a serious offence” wrote Suleiman Haruna, Director of Information in the office of Mrs Buhari. She had earlier refuted allegations suggesting that she used her ADC to collect funds from unsuspecting members of the Public. “It was the Nigeria Police Force, being his employer, that arrested him to investigate the allegations leveled against him because the case is within their jurisdiction,” she said. Aisha advised the suspected victims of the scam to recover their money and whatever he took from them from Baban-Inna.